MayDay is tomorrow--what is your organization doing for emergency preparedness? Pre-applications for the Minnesota Historical and Cultural Heritage Grants mid/large grants are due Friday May 2, 2014. Pre-applications are required and must be submitted via the grants portal by end of day on Friday. Requests for logins (new accounts) will not be accepted after Thursday, May 1. Contact the Grants Office with questions. The Grand Center for Arts and Culture, New Ulm MN, received funding for interior systems work, part of a phase one renovation of the Grand Hotel. This phase of the project included handicap-accessible restrooms. The project also included updating electrical, plumbing and the HVAC systems primarily on the second floor. Recipient: The Grand Center for Arts and Culture, Inc. Annual meetings kick off the spring season all around Minnesota. Millenials trust peers over professionals. What might this mean for history organizations? Digital Public Library of America marks its first birthday. How does one teach history students to work with the public? Corporation for National and Community Service, Des Moines IA, seeks State Program Specialist. Deadline: May 5, 2014. California Department of Parks and Recreation is accepting applications to take the examination for the State Historian II classification. This step is required for applicants to be put on the eligibility list and to be considered for vacancies for that title. Final file date: May 6, 2014. Mississippi Department of Archives and History, Division of Historic Properties, Greenville MS, seeks Historic Resources Specialist I. Deadline: noon, May 9, 2014. Indiana Medical History Museum, Indianapolis IN, seeks Executive Director. Deadline: May 12, 2014. Lake County Discovery Museum, Wauconda IL, seeks Visitor Services Assistant. Deadline: May 13, 2014, 4:30 p.m.
Will Rogers Memorial Commission, Claremore and Oologah OK, seeks Executive Director. Deadline: May 31, 2014. Texas Historical Commission, Austin TX, seeks Rehabilitation Tax Credit Specialist. The George Washington University, Washington, D.C., seeks Processing Archivist. Position open until filled. Dorothy Molter Museum, Ely MN, announces a new exhibit about Dorothy Molter, open now at the Forest Service History Center, Ely. Call 218-365-4451 for more information. Anoka County Historical Society, Anoka MN, hosts Michael Ritchie, who will speak on "Civil War Small Arms," Thursday May 1, 2014, 7 p.m. Call 763-421-0600 for more information. Minnesota Discovery Center, Chisholm MN, hosts Teen Tinker Lab for kids ages 10 and up, Saturday May 3, 2014, 11 a.m. to 1 p.m. The objective for this lab will be to building the most useless machine ever. Contact Mai Vang, 218-254-1238, for more information. Anoka County Historical Society, Anoka MN, hosts a program on Prohibition, rum runner, and temperance, Saturday May 3, 2014, 2 p.m. Call 763-421-0600 for more information. Scott County Historical Society, Shakopee MN, will host a Girls' Spring Tea, Saturday May 3, 2014, 1:30-3 p.m. Cost $8/person. Call 952-445-0378 for more information. LeDuc Historic Estate, Hastings MN, invites the public to Authors' Sunday, May 4, 2014, 1 p.m. Featured authors will be Michael Resman and Heidi Langenfeld. Call 651-437-7055 for more information. Maplewood Area Historical Society, Maplewood MN, will hold an Open House, Sunday May 4, 2014, noon-3 p.m. Call 651-900-3539 for more information. Dakota City Heritage Village, Farmington MN, and co-sponsor Dakota County Historical Society, South St. Paul, MN, present "The Origin of Food--Early Farming in Dakota County, 1860-1920s," Sunday May 4, 2014, 1-4 p.m., Dakota County Fairgrounds, Farmington. Call 651-460-8050 for more information. Landmark Center, St. Paul MN, invites the public to the Fifth Annual Pan Asian Festival, Sunday May 4, 2014, 4 p.m. Free. Minnesota Discovery Center, Chisholm MN, in partnership with the Sami Cultural Center of North America, announces the opening of a new exhibit on Sami reindeer herders, May 5, 2014. Call Mai Vang, 218-254-7959, for more information. Anoka County Historical Society, Anoka MN, will hold their popular Ghosts of Anoka walking tours this spring, May 8, 10, 22, and 24, 2014. Advance registration required. Call 763-421-0600 for more information or to register. Harkin Store, New Ulm MN, will be open for a special Mother's Day program, Sunday May 11, 2014, 1-4 p.m. Call Harkin Store, 507-354-8666, or Nicollet County Historical Society, 507-934-2160, for more information. Excelsior-Lake Minnetonka Historical Society, Excelsior MN, hosts Millie Goodermont, who will speak on the Miss Minnesota pageants held at Excelsior Amusement Park, 1941-1953; Monday May 12, 2014, 7 p.m., Jake O'Connor's. Call 952-221-4766 for more information. Edina Library (Hennepin County Library system), Edina MN, hosts author Joe Bissen, who will speak about his new book, "Fore! Gone. Minnesota's Lost Golf Courses 1897-1999," Monday May 12, 2014, 7-8 p.m.
Friends of LeDuc of Historic Hastings will meet Tuesday May 13, 2014, 7 p.m. at the LeDuc Historic Estate, Hastings MN. Joan Mathison will discuss the "LeDucs in St. Paul" walking tour. Call 651-437-7055 for more information. Stearns History Museum, St. Cloud MN, announces the next Breakfast Club, "Yorkville Twins," about Minnesota teachers Joseph and John Gindele. They will present their new book at the museum, Wednesday May 14, 2014, 9 a.m. Contact Debi Pack, 320-253-8424, for more information. Ramsey County Library-White Bear Lake hosts Mary Lou Judd Carpenter, daughter of Minnesota Congressman Walter Judd, who will speak about her parents and read from her mother's letters, Wednesday May 14, 2014, 6:30 p.m. Call 651-724-6130 for more information. St. Louis County Historical Society, Duluth MN, presents "Lunch with the History People," Thursday May 15, 2014, noon-1 p.m. Stephen Mulholland will present "Archaeology in St. Louis County: 30 Plus Years of Exploration and Adventure." Call 218-733-7568 for more information. Isanti County Historical Society, Cambridge MN, will host musicians Angie Senger, Joe Chock, and Doyle Peck for an Armed Forces Day Concert to honor past and present military, May 17, 2014, 6 p.m. Purchase tickets online or at the ICHS History Center. Call 763-689-4229 for more information. Pond Dakota Heritage Society, Bloomington MN, hosts Mary Bakeman, who will speak about recovery in the aftermath of the U.S.-Dakota War of 1862, Sunday May 18, 2014, 2 p.m. at the Historic Pond House. Call 952-563-8674 for more information. Ramsey County Library-White Bear Lake hosts Darryl LeMire, Vietnam veteran, who will speak about his wartime experiences, Monday May 19, 2014, 6 p.m. Call 651-724-6022 for more information. Pond Dakota Heritage Society, Bloomington MN, will conduct a tour of Bloomington Cemetery to discuss missionary and Dakota families, Monday May 26, 2014, 2 p.m.; meet at the cemetery. Free. Call 952-563-8674 for more information. Wright County Historical Society presents, "The Evolution of Baseball Gloves: A Hands-on Presentation with Fred Budde" Tuesday May 27, 2014, 6:30-7:45 p.m. Free and open to the public. Call 763-682-7323 for more information and to RSVP. Waseca County Historical Society, Waseca MN, presents the final Spring Luncheon-Lecture Series with Dong Lodermeier, author of "Minnesota Duck Decoys," May 29, 2014, noon-1 p.m. Call 507-835-7700 for reservations. Friends of LeDuc of Historic Hastings will tour the Minnesota History Center archives and Upper and Lower Landings to learn more about William LeDuc in St. Paul, Saturday May 31, 2014, 10 a.m. Call Heidi Langenfeld, 651-208-6665, to reserve a spot. IRS will hold a Form 990 Filing Tips webcast presentation, Thursday May 8, 2014, 2 p.m. ET. CE credit available. Stearns History Museum, St. Cloud MN, hosts an instructional webinar on FamilySearch.org, Tuesday May 13, 2014, 10-11 a.m. Lori Bessler, Reference Librarian & Outreach Coordinator at the Wisconsin Historical Society Library Archives will present. RSVP to Sarah Warmka, 320-253-8424. Minnesota Association of Museums invites your historical organization to celebrate Minnesota Museums Month, May 2014. Minneapolis Star Tribune will publish a special section on Minnesota Museums. Visit the Minnesota Museums Month website for updates! Make sure to update your museum's listing and post May events through Explore Minnesota. Isanti County Historical Society, Cambridge MN, is gathering information on Minnesota historical organizations, in particular their funding sources and staff salaries. Please take the online survey or contact Kathy McCully, 763-689-4229, by Friday May 2, 2014 to contribute to her research. Washington County Historical Society, Stillwater MN, announces that Dustyn Dubuque has been hired as the Hay Lake School Museum site manager. Call 651-433-4014 for more information. Historyapolis Project, Augsburg College, Minneapolis MN, invites the public to help gather and write the history of Minneapolis. Questions about the project can be directed to Kirsten Delegard. Norman County Courthouse, Ada MN, recently underwent a renovation, partially funded by the State Capital Projects Grants-in-Aid program. Cultural Data Project (CDP), Philadelphia PA, announced that John Federico will join the organization as Director of External Affairs, effective June 2, 2014. Minnesota State Arts Board announces that the FY 2015 Cultural Community Partnership grant program is now open for application. Deadline: July 18, 2014, 4:30 p.m.
Steele County Historical Society, Owatonna MN, found a way to warm up the spring last Thursday with a ceremonial burning of the mortgage on their facility, built in 2012. Well done to retire debt early! Generally speaking, history organizations in Minnesota do not carry a mortgage in facility projects. The payments can have a crippling effect on future budgets. One organization even found that some who had pledged later declined to honor pledges since the organization "had enough money to build." Retiring the debt can also be a long process as donors like to see new things. Despite the hazards to debt, sometimes it is unavoidable in facility projects. You just need to have a good understanding of what you are getting into before undertaking a facility project. 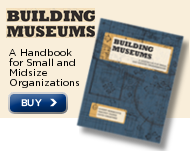 For more tips, see Building Museums: a handbook for small and midsize organizations. Toys of the '50s, '60s and '70s, by Kate Roberts and Adam Scher. New from Minnesota Historical Society Press. Toys of the '50s, '60s and '70s exhibit opens May 24, 2014.